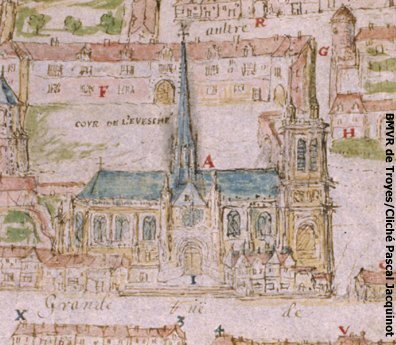 Detail of "plan et figure de l'église de Troyes...", 1600 - (c) BMVR de Troyes, Phot. Pascal Jacquinot The cathedral of Troyes, located at the heart of the city and inside the first ramparts, was preceded by many buildings; an oratory in the 4th century, a significant building in the 9th century, and a Romanesque cathedral built in the 11th century by Bishop Milon, destroyed in a big fire in 1188. 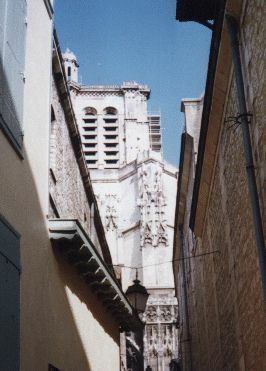 In 1208, under the leadership of Bishop Hervée, construction work of today's cathedral began. This lasted up until to the 17th century (1640 according to some historians), but never ended, since the second tower, the tower Saint Paul, could not be built by lack of funds... A 110-metre-high steeple used to stand on top of the cathedral's roof; a storm destroyed it in 1700. 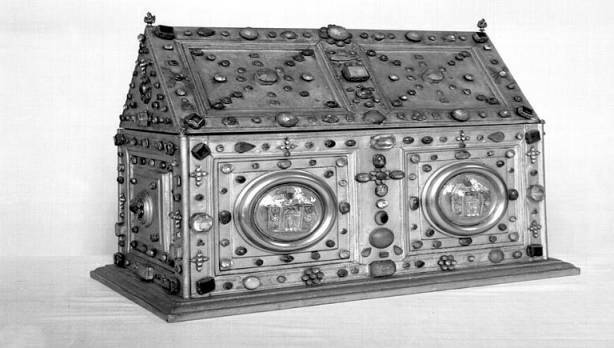 It is with bishop Garnier de Trainel, Chaplain of the fourth crusade, that the collection of the Cathedral's treasure really begins. 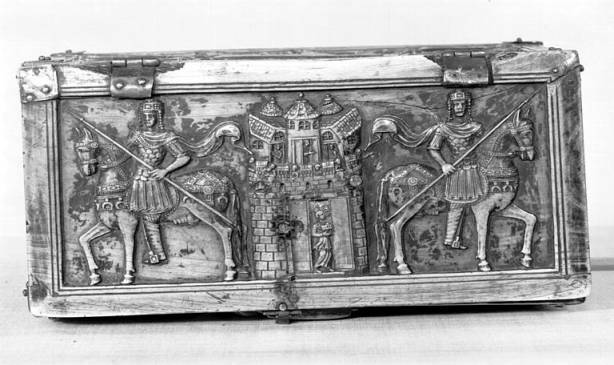 Keeper of the holy relics stolen by the crusaders during the siege of Contantinople in 1203, he ordered his men to bring some items back to Troyes, including the vase from the Cene, a piece of the real cross, and relics from many saints and apostles. Centuries after centuries, the treasure's collection grew until the 1789 Revolution : it was then compeletely dispersed and even partly destroyed by a local goldsmith named Rondot, in 1794. The canon of the cathedral will do its best through the 19th century to restore the treasure as we know it today, without ever attaining its original splendor. They all date from the 13th century, and represent the life of Jesus Christ, the Virgin and some saints. They were restored in the middle of the 19th century by a local glassmaker, Vincent Larcher. The windows of the triforium and the upper bays of the apse also date from the first period of the building of the cathedral in the 13th century. The upper windows of the nave are less old, as the Jesse tree, created at the end of 15th century. 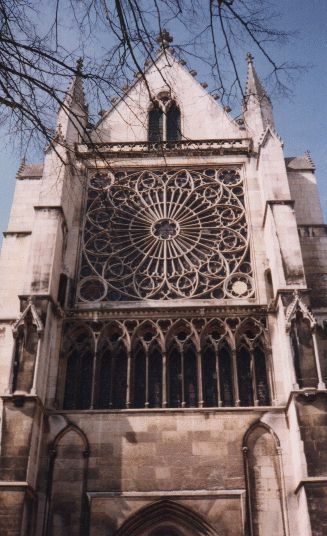 The great rose at the south end of the transept was installed in 1844. Nave ; The twelve apostles, 14th cent. The themes painted in the cathedral's windows are varied, and do not obey to any particular order. One can find many scenes from the bible of course, chosen more often by their generous donators than by some head of works responsible for any kind of cohesion... Local bishops (Hervé and Garnier de Trainel among others) are represented in the upper windows of the choir, together with the relics of the fourth crusade. One can find some works from the famous local glass painter in the cathedral. 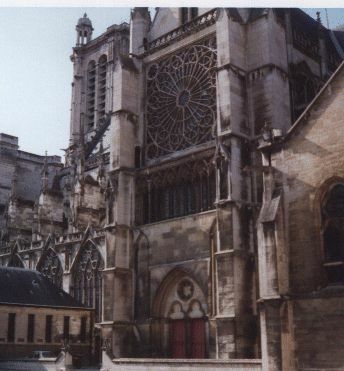 He made the window of the "pressoir mystique" - mystical press - in 1625 (left), as well as the windows of the immaculate conception, taken from church Sainte Etienne when it was destroyed in 1792.